Many eyes turned at Pedro’s Judo Center during practices in 2009. When Ronda Rousey and Kayla Harrison faced off, it was the round to watch. Rousey, now an undefeated UFC champion, became the first U.S. Olympic women’s judo medalist when she took bronze in 2008. Harrison, then 18 years old, was also at the Beijing Olympics, only as a training partner for the 21-year-old Rousey because the U.S. did not earn a spot in Harrison’s weight division for those Games. To prep, Rousey and Harrison went to a camp in relative seclusion at the home of their coach’s father off Arlington Pond in Salem, N.H. They fought in the mornings outside, shaded from the July sun by a tarp normally used to cover a car. Then they ran around the lake. When they got back, Rousey and Harrison descended into the cellar and lifted weights. “It was a catfight every day in the dojo,” said their coach, Jimmy Pedro. Harrison became the first American to win an Olympic judo gold medal at the London 2012 Games. That came three years after her last training bout with Rousey. In 2009, Rousey made a brief comeback to judo one year after capturing Olympic bronze, Harrison and Pedro said. After two months training at Pedro’s Judo Center in Massachusetts, and a few days training in Japan, Rousey unexpectedly quit and flew home to California, leading to her switch to mixed martial arts. Rousey has said Pedro disapproved of MMA. They left on unfortunate terms, the way Pedro and Harrison tell it. Rousey had returned to training with Pedro’s judo group for two months in 2009 when she accepted an offer, with Pedro’s blessing, to spend a year training in Japan, the birthplace of the sport. Some of America’s best judokas spent blocks in Japan, including the two-time Olympic bronze medalist Pedro. Rousey would receive $40,000 for one year with housing and food paid for, plus two trips back to the U.S. to visit family, Pedro said. Pedro said he’s occasionally seen Rousey since 2009 and wished her luck in person. He called her an icon and the most recognizable female athlete in the world in an interview last week. Harrison is often asked if she might pursue MMA. She’s received offers. Even Rousey has brought it up as the former roommates talk on the phone or text. Rousey, who is quite good at putting on a show and talking trash, admires Harrison’s attitude. Harrison can’t fight in MMA at her Olympic weight. Her judo weight class is a maximum 171 pounds. The highest women’s MMA division caps at 145. But Rousey competed in Olympic judo in one division lower than Harrison and has dominated in MMA since dropping 15-20 pounds in competition weight. So it’s possible. And Harrison can be buoyed by the fact that she closed the gap on Rousey in their head-to-head sessions from that pre-2008 Olympic camp to those two months in 2009 when they were so competitive that everybody in the dojo had to watch. “Who knows, maybe after Rio, [MMA] is what I’ll want to do,” Harrison said. NEW YORK — Kayla Harrison unraveled from her bed one day in spring 2013, took a step and collapsed. “I finally needed to call a doctor,” she said. Back in March 2012, Harrison heard her left knee snap while training in Japan and thought she partially tore the MCL. Five months after that, she became the first American to win an Olympic judo gold medal. Following the media tour and the parties, she returned to training with coach Jimmy Pedro in Massachusetts in early 2013. The knee pain returned, too. “It would bug me, bug me, bug me,” daily, recalled Harrison as she sat in the lobby of the New York Athletic Club overlooking Central Park last week. Until that spring day, when she fell, relented and saw Boston Celtics team physician Dr. Brian McKeon. Harrison found that a ligament smaller than her MCL was actually torn instead. And her knee had been subluxing, basically dislocating in and out for a year without her knowledge. “I had a pothole in my knee,” she said. 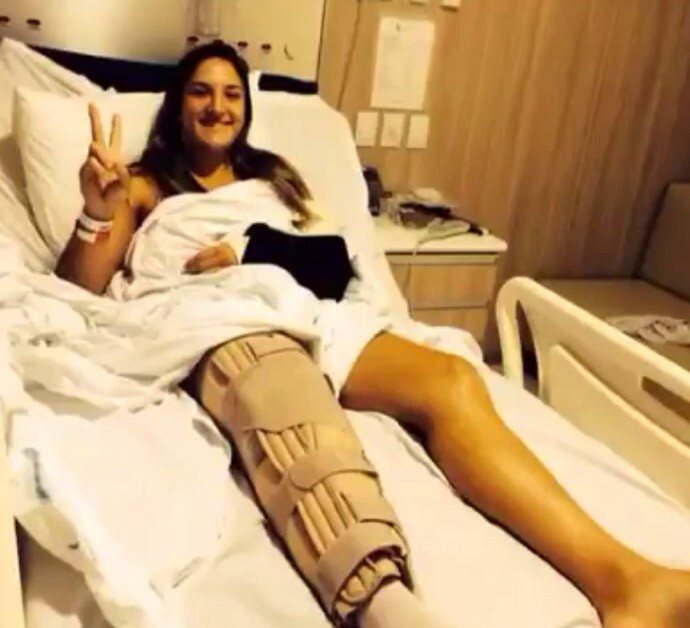 Harrison underwent reconstructive knee surgery in June 2013, knowing it would keep her out of competition for a year, if she decided to continue with the sport. What is wrong with me, Harrison thought to herself. Why do I keep putting myself through this? I have everything that I want. A World Championship. An Olympic title. “But judo is sort of the love of my life,” the 24-year-old reasoned. At the Olympics, Harrison leaped after the gold-medal match into the arms of fiance Aaron Handy, with whom several years ago she confided her story of being sexually abused by a former coach as a teen. Harrison and Handy have since parted ways. Harrison talked going into London of retiring if she won gold. She wanted to become a firefighter. But now, motivated by the surgery setback, Harrison is making what will likely be her final Olympic run. She said she can join judo legends with a victory in Rio de Janeiro next summer. She may have to go through one of the host nation’s biggest Olympic stars to do it. “The comeback has started. #Day1,” was posted on Harrison’s Instagram following the surgery. She spent six weeks in a straight leg brace. Her apartment had stairs, so she stayed with Pedro’s father for the first two months because she could barely walk. Harrison also took Harvard Extension classes. One was in creative writing, Introduction to Memoir, which sparked her to restart work on her own book, with Dave Wedge, who co-wrote an account of the 2013 Boston Marathon bombings that is reportedly the basis of an in-the-works film. Harrison was back on the mat training in early 2014 but struggled to regain knee strength. The 2014 World Championships in Chelyabinsk, Russia, marked her fifth competition since returning from the surgery. “She wasn’t ready,” Pedro said. Harrison reached the 78-kilogram semifinals, relying on her instincts, mental strength and the gold-medal confidence of knowing she could beat anybody on her best day. She drew Brazilian Mayra Aguiar in the semifinals. The two have a history. Harrison defeated Aguiar in the final to win her only World Championship in 2010. She beat Aguiar again in the London Olympic semifinals, what Pedro called the toughest match of that tournament, since Aguiar was ranked No. 1. This time in Chelyabinsk, Aguiar put Harrison away en route to a World Championship. The Brazilian’s loudly yelling coach was kicked out mid-match by the referee. Harrison came away disappointed with bronze and a career head-to-head with Aguiar split at 6-6, which Harrison was reminded of during a late January trip to Brazil. Local media sat them down for a TV show where they watched that Worlds match together and conversed about it. Aguiar speaks English. She will be one of Brazil’s most hyped athletes at the Rio Games, given the nation has won three gold medals combined across all sports at each of the last two Summer Olympics. Harrison saw Aguiar’s face on a bus during the Brazil trip and estimated one million children participate in judo in the nation. Pedro would like as much pressure on Aguiar as possible going into the Olympics. And as little on Harrison’s shoulders. Harrison won three straight competitions in December in Tokyo, February in Düsseldorf, Germany, and March in Tbilisi, Georgia. But Aguiar, who is one year younger, was not at any of those tournaments won by Harrison. And she, like Harrison, underwent surgeries after the London Olympics — shoulder, elbow and knee for the Brazilian. At Rio 2016, Harrison could become the first non-Asian woman to successfully defend an Olympic judo title. She will be 26 years old in 2016 and, probably she said, finish her judo career in Rio. Her only reason for continuing would be for the setting of the 2020 Olympics — Tokyo. Japan created judo, and her World Championship in 2010 was won there.